I have tried to get at least one further confirmation; a coroner’s report, word from an immediate family member in Delaware, a funeral home announcement. The closest I have come is assurance from reporter Mark Stryker of The Detroit Free Press that Bugnon is Byrd’s nephew. Based solely on Bugnon’s claim, The Free Press has gone with the story, as have NBC News, The Guardian and The Huffington Post, among many other outlets. Hoping that they are right, hoping that they are wrong, so has Rifftides. Byrd was part of a generation of youngsters who exploded out of Detroit in the 1950s to make a major impression in jazz, injecting high levels of musicianship and energy into the New York jazz scene. The Motor City coterie also included baritone saxophonist Pepper Adams, guitarist Kenny Burrell drummer Elvin Jones and pianists Tommy Flanagan and Barry Harris. From Wallington’s band, Byrd moved to Art Blakey’s Jazz Messengers, then to the Max Roach group. He worked frequently in the 1950s with John Coltrane, Red Garland, Lou Donaldson and Gigi Gryce and in the ‘60s with Sonny Rollins, Hampton, Monk, Coleman Hawkins and others, and led his own quinet. He recorded prolifically. Byrd and his Detroit pal Pepper Adams were close musically and personally and in the late fifties and early sixties shared leadership of a quintet that bore their names. The album cover in this video lists the players. Thad Jones, another of those remarkable Detroiters, wrote the tune. In his Free Press obituary, Mark Stryker hit the right tone in describing Byrd’s style. 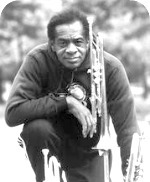 Byrd’s warmly burnished sound, fluent technique and aggressive-yet-graceful swing was rooted in the style of Clifford Brown, but his gangly, rhythmically loose phrasing was a unique calling card right from the get-go. As Byrd matured in the late ’50s and early ’60s, he tempered his hummingbird flourishes with a cooler sensibility and phrasing that recalled Miles Davis. Byrd was graduated in music from Wayne State University in 1954. He later earned a masters degree from the Manhattan School of Music and a doctorate in music education from Columbia. His academic career paralleled his work as a player and sometimes moved it to the back seat. He served as an instructor at New York’s High School of Music and Art and taught at several universities, among them Rutgers, North Carolina Central and Delaware State. When he was at Howard University in Washington DC in the 1970s he formed, and produced records by, a band called The Blackbyrds that included some of his students. His own earlier Black Byrd album for Blue Note became a hit in the pop soul genre. In many of the stories that appeared today, much is made of rap and hip-hop performers sampling Byrd’s pop music for their own albums, as if that legitimized him. Doug, you’re becoming, perforce, our Jazz Necrologist (a role not enviable, but very necessary). These latest entries are splendidly memorable. You are getting into a more available form of music and words to be savored and never forgotten. Thank you. “Necrologist” doesn’t spring to mind as the title I want on my tombstone, but thanks for the thought. James Moody told me that his grandmother once said, “Folks is dyin’ what ain’t never died before.” Folks keep on doing that, and I suppose it would be a dereliction of duty not to acknowledge the passing of those who have enriched us through their music. A couple of minor quibbles: BLACK BYRD, the album, is from 1973 and has nothing to do with The Blackbyrds, the Howard University kids who had a run of hit records, produced by Byrd, from 1974-81. Mr. Porter’s correction is acknowledged with gratitude and incorporated into the post above. Thanks, Bob. Beautiful tribute Doug, thank you. This news really saddens me. Donald Byrd’s playing has always struck me as exceptionally warm. The contrast with Pepper Adams’ gruff baritone is a real treasure. Thanks for eloquently marking Byrd’s passing and quoting from my Free Press obituary. “Bitty Ditty” is an enigmatic, elusive minor-key tune with unique harmonies and a 41-bar structure. The form is A-A-B-A1 (12-12-8-9) but the 12-bar sections are not a blues. Yet on Jones’ original recording for Debut in Aug. ’54 the band in fact uses the 12-bar blues for solos. So does the group on “Motor City Scene.” Miles Davis, who spent about six months in Detroit when he was trying to kick his drug habit in 1953-54, played and hung out a lot at the Blue Bird and he loved Thad. While there he picked up on “Bitty Ditty,” which he recorded for Prestige in Aug. 1955. However, Miles’ group actually solos over the entire form and original changes, except for one tweak: During the solos they play the last A section as 10-bars to make a 42-bar chorus. This is the only recording I know that uses the original form for the solos, but if your readers know of others I’d be delighted to learn of them. One other footnote to “Motor City Scene.” The drummer is listed on the record as “Hey Lewis,” which is a pseudonym for Louis Hayes. I have no idea why his real name wasn’t used; he wasn’t under contract to another company. Seeing the record here reminded me that I have to ask him what the hell that was all about. I was sad to read of the passing of Donald Byrd. Thanks to DR for this nice remembrance. At my first opportunity I will relisten to a personal favorite: Donald Byrd performing, with his longtime colleague Pepper Adams ( in a 10-piece band fronted by Thelonious), on Thelonious Monk Orchestra at Town Hall, the wonderful 1959 recording. “Little Rootie Tootie” features the always-great Adams and Byrd team, inspiring each other on one of the great musical moments of jazz history. Monk gave Byrd an extended solo, and he reacts with such a great trumpet solo, worthy of anyone’s career. If you haven’t heard it lately, you’ll still remember to recommend that recording to anyone! Orrin Keepnews, who produced Monk’s Town Hall Concert and the recording, told filmmaker Bret Primack about the rescue of “Little Rootie Tootie.” To see Orrin tell the story, go here. The interview encore is a short story about Bill Evans.